IN ORDER TO CONTINUE PROVIDING HIGH QUALITY SERVICES AND GUARANTEEING THE SATISFACTION OF OUR CUSTOMERS, AS WELL AS DRAWING UP INNOVATIVE SOLUTIONS, WE WISH TO INTRODUCE TO YOU OUR NEW COMMUNICATIONS SYSTEM – A SYSTEM FREE OF CHARGE TO OUR CUSTOMERS – THE getsix® ‘CUSTOMER EXTRANET’ E-SERVICE. 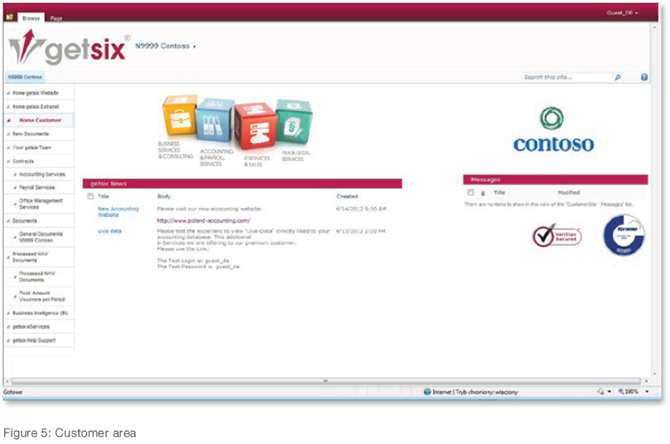 WHAT IS getsix® ‘CUSTOMER EXTRANET’? This integrated communications system is based on an access to business resources and their exchange between customers and our office. Through the individual accounts which we create, you will have round-the-clock access (24/7) to your data, as well as information and messages, updated systematically by our staff. This new function enables long-term exchange of information between us and our customers, as well as complete control of your data. Thanks to the extranet, the entire process of communication between you and our office will become considerably more effective and cohesive. Data transfer takes place via secure SSL connection, which is also typical for operations such as electronic banking. This type of connection may be recognized by a colour change of the status bar in the web browser on your computer. 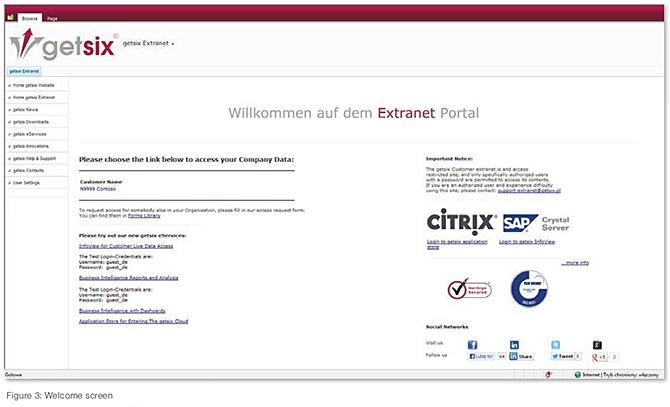 Thanks to the extranet, you will save time and money! Instead of using several different applications for communication or exchange of data, this may be undertaken working with a single website – the getsix® ‘Customer Extranet’ site. You will find there reports which we have sent to you electronically in PDF format, organized chronologically, meaning that all of the information may be seen at once. Your data benefit from many protections and are assigned for your use only. If you will have no access to emails while on a business trip, you are still able to receive accounting or payroll information, for example from any computer with Internet access. Of course, getsix® ‘Customer Extranet’ also operates on modern tablets and other devices, such as the iPad or iPhone. 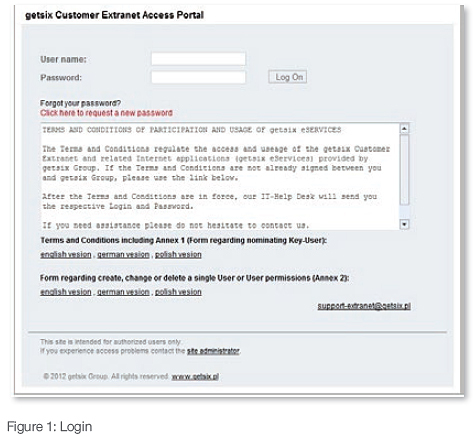 When the address ‘https://extranet.getsix.pl’ is entered into a browser, the login screen appears (see Figure 1). Here you should provide your login and password. Once getsix® ‘Customer Extranet’ has been initiated, you will receive an user name and password from the IT-Desk which should be entered the first time you log in. It is possible to change this password at any time. The getsix® ‘Customer Extranet’ website is protected by Extended Validation (EV) SSL, the highest standard of website authentication. EV SSL means that our organization has undergone a strict process for authentication of enterprise identity. WHY DOES THE WEB BROWSER ADDRESS BAR CHANGE COLOUR TO GREEN? In particularly secure web browsers the address bar changes colour to green following connection with the EV SSL certificate (see Fig. 2). In addition, it also displays ‘https://’ and the name of the business – ‘getsix’ – as the website owner, as well as ‘VeriSign’, the certifying institution which has checked the identity of the owner in a strict authentication process. WHAT DOES (EV) SSL MEAN? Secure Sockets Layer (SSL) certificates are a standard method used on the Internet to help ensure secure communication between user and website. This technology provides a twofold guarantee: it authenticates website identity and encrypts the communication between the two. Extended Validation (EV) SSL certificates represent the highest standard of authentication. This standard has been approved by the CA/Browser Forum, a group of leading SSL Certificate Authorities (CAs) and web browser creators. The standard requires that each website protected by EV SSL has undergone a proven process to check the identity of the organisation responsible for the website by very strict means. In the course of the validation process the CA must ascertain that the applicant is the owner of the domain and that the person approving is employed by the applicant and authorised to obtain the Extended Validation SSL certificate. 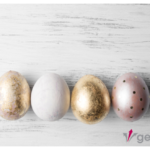 For 97 of the 100 largest banks in the world utilising SSL certificates, and for 93% of Fortune enterprises, VeriSign is a first-choice organisation in the sphere of website protection (this relates to branches and daughter companies of VeriSign also). The VeriSign Trust™ brand enjoys the confidence of major banks and commercial enterprises, and makes it possible to trust each and every website which it certifies. When you log in with your username and password, the welcome screen appears (see Fig. 3). On the left-hand side of the welcome screen is the navigation menu, by means of which it is possible to move to particular content at the portal. For example, the menu entry ‘getsix® Downloads’ leads to a list of files for download (see Fig. 4), within which it is possible to find such useful material as the leaflets and forms which we make available to our customers. Via the menu entry ‘getsix® Help & Support’ you will be able to find further helpful information and tips relating to the operation of our ‘Customer Extranet’. ‘getsix® News’: Here we post important information and announcements, prepared specially for our customers (see also Fig. 5). ‘User Settings’: In this location you are able to change your password and e-mail address. Located to the right are also links to further getsix® eServices, ‘Reporting Portal’ and ‘Application Store’ (more on this in other Factsheets). In addition, there is a link to the extranet help section of our IT-Desk department, to which you may turn at any time with questions relating to extranet use. In the central part of the welcome screen (Fig. 3) is a link leading directly to the customer area of the portal. Contained within the link is a customer number and business name. If we provide the service to several of your enterprises, a separate link is visible for each. For administrative and legal reasons the portal is constructed such that all of the information posted in the customer area for each of your enterprises is managed separately. 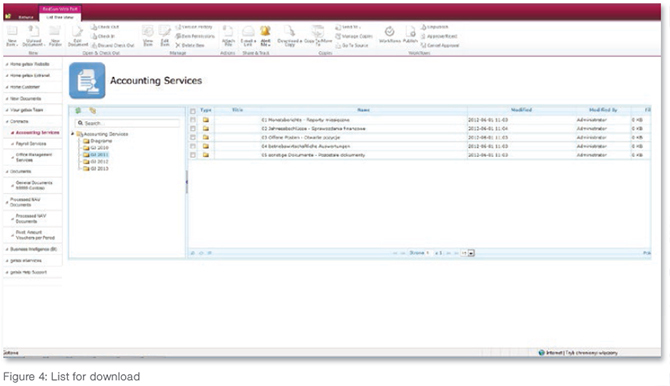 Clicking on the appropriate link opens the customer area of the portal (Fig. 5). In the customer area the logo of your business appears on the right-hand side of the screen. All announcements directed to you will be found there. The central part of the screen in the customer area holds the News section, which is where we post all important information and announcements for our customers. On the left-hand side is the navigation menu, which allows rapid access to information you may require. Below we look more closely at a number of options and menu entries. Via the ‘New Documents’ menu entry you will find all documents which we have posted to the portal over the past four weeks. Searching for them in individual document libraries is therefore unnecessary. Via the ‘Documents’ menu entry and ‘General Documents’ sub-menu you will find a document library in which files (Excel files, Word files, PDF files, photos etc.) may be made available not only by getsix®, but also by any authorised user. A user is thus able in a single location to store specific files for later use or make them available to us for compilation. Via the ‘Contracts’ menu entry opens a separate secondary menu entry for each of the services which we provide, e.g. ‘Accounting Services’, ‘Payroll Services’ or ‘Office Management’. For administrative and legal reasons the information for each service or contract for service provision are stored in a separate document library. We name this the documentation area, because here we save documents and reports which we have drawn up and made available to you. 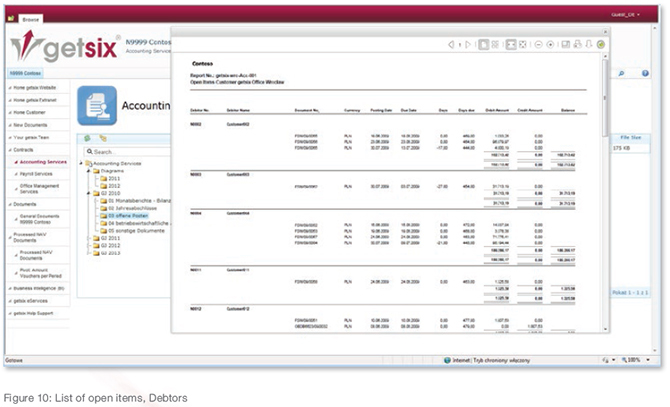 Therefore it may happen, to give just one example, that a user has access to the Accounting section, but not to the Payroll section. The entitlements to read and save which has each portal user, are assigned by a so-called Key-User. More information on this can be found in the terms of participation and relevant annexes (You will find appropriate documents for download in the login window). 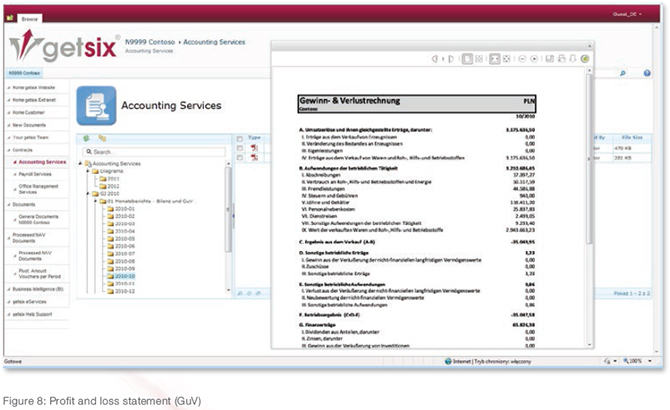 In order to present more in detail how the portal operates, in the next example we move on to the document area in the Contract Accounting module. In the document area (Fig. 6) you will find all reports which we send to you electronically in PDF format, organised chronologically, meaning that all of the information may be seen at once. 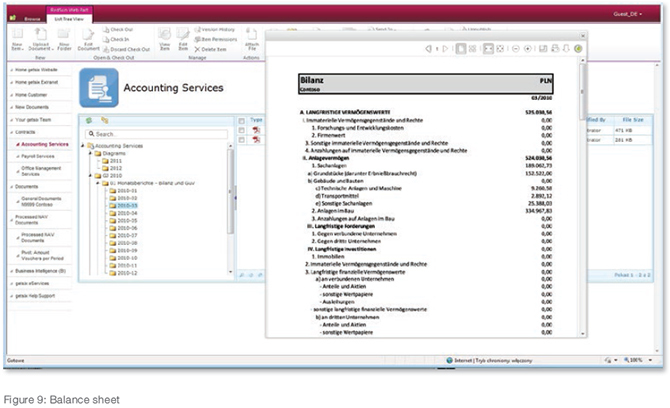 In the document area for the Accounting module you will, as standard, find your reports grouped according to fiscal year and for each subject located in a separate folder. If you prefer another organisational structure, we will readily adjust it to your expectations and take your suggestions into account. 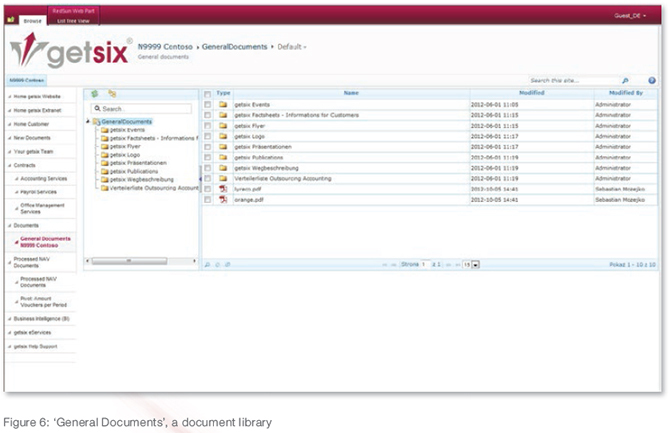 The idea of the document area is a document library as convenient to use as the well-known Explorer from Microsoft. This library also has a Viewer function, allowing files to be browsed without opening, e.g. using the program Adobe Reader. The document browser in turn has the ‘Print’ and ‘Download’ functions, thanks to which it is possible to print a document currently being viewed or download it to your computer. We would like to show you in subsequent figures, using the example of the Accounting module, how easily and intuitively our portal can be used. 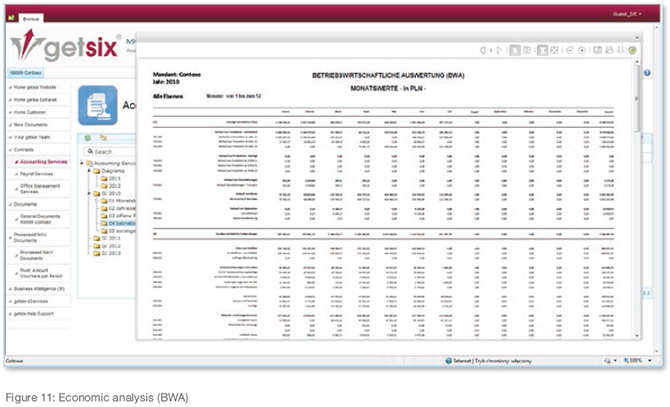 It is also possible to see how our reports (profit and loss statement, economic analyses (BWA) etc.) 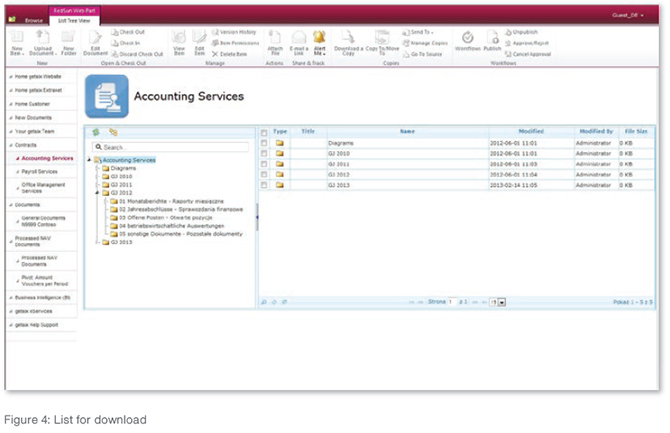 are constructed and structured in a document library for the Accounting module. The situation is analogous for the Payroll document area, i.e. important information is to be found there, such as a payroll itself. If you make use of our test access, you will be able to see examples of reports in this area and consider the advantages of professional reporting. If we provide you with the Office Management Service, in this area you will find complete correspondence, or the post which we have received in your name, organised chronologically. The majority of reports will of course be provided with the logo of your business, thanks to which you will be able to use them both internally and externally. We are also able to adjust all reports to your requirements. An important and exceptionally useful function of getsix® ‘Customer Extranet’ is the automatic notification that objects have been added, or that we have introduced changes in libraries or lists. Users are able to take advantage of these functions to receive electronic notification of changes in a document area immediately, with daily lists for specific hours or every week. This is a useful function which allows users to remain up to date with information and changes. By making use of it you can avoid missing information at the portal added by us or changed, and you will be informed automatically and electronically, whether immediately or at intervals of time which you have defined. A detailed description of the activation of the Alert-Me function can be found in the help and support area of the portal, and even inexperienced users will be able to configure it with ease. As such, with no great difficulty, you will be able to configure your own individual notification system. Users are able to change the e-mail address provided in the system independently. This is particularly useful if you are taking advantage of the Alert-Me function mentioned above and your e-mail address changes or you would like to receive notifications to a specific address. With concern for data security, users are able to change their passwords at any time and thereby prevent the abuse of data. We are constantly working on the further development of getsix® ‘Customer Extranet’ so as to provide you with additional benefits. Well-founded decisions are a basis for success in your business activity, and key here is staff are able to build on correct information to evaluate specific situations in the activity competently, and at the same time respond rapidly. Thanks to the BI solutions in the getsix® eService portfolio, decision-makers at all levels at your business have access at any time to necessary data and analyses, which guarantees greater far-sightedness and flexibility.Take advantage right away of this advantage over the competition! 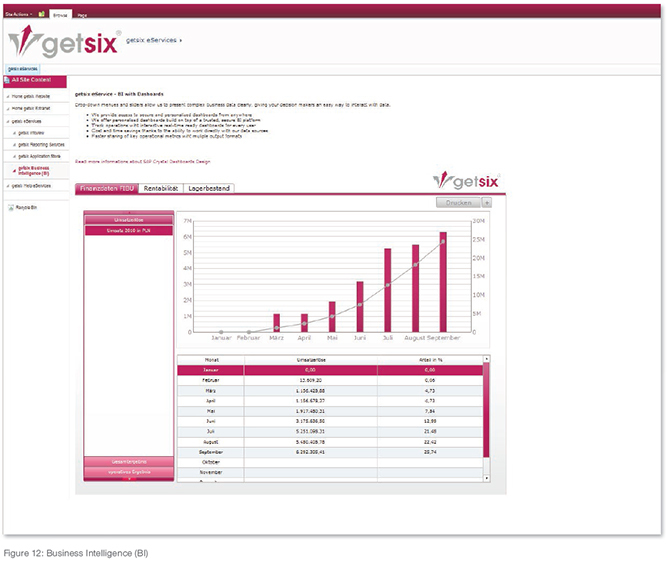 For the needs of the getsix® BI with Dashboards eService we use appropriate SAP software. 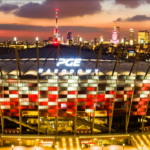 More on the subject of the information technologies utilized at getsix® can be found at our website (http://www.getsix.pl). 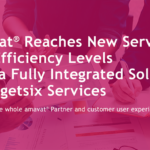 The getsix® e-Service described is not yet implemented in our Customer Extranet as standard, but our IT-Desk is able in the course of several days to make this function available ready for use. Within the offer you will receive at an attractive fixed price a functionality allowing you to make better decisions, and your enterprise will increase turnover (see Fig. 12). In order to test our ‘Customer Extranet’ eService thoroughly, we offer the option of test access. There you will find examples of reports for a sample business of our creation, Contoso GmbH. Every customer can take advantage of getsix® ‘Customer Extranet’ free of charge – this is our contribution to higher productivity for your business. In order to activate the Customer Extranet eService we need from you the surnames of potential users of the system and details of assigned authorizations, for the individual areas or specific information to which a given user is to have the right of access. For each agreement (Accounting, Payroll etc.) a special area of content (document library) is made available for which we are able, at your request, to adjust the individual access rights for each user. Staff at the Customer Desk and IT-Desk will go through the necessary arrangements and settings with you. Once we have received all necessary access data you will receive detailed instructions for the use of the extranet. As soon as you have received these we invite you to take advantage of our new communications system and be persuaded of the benefits of getsix® ‘Customer Extranet’. Individual introduction and implementation at our website is the responsibility of the Customer Desk in collaboration with the IT-Desk.